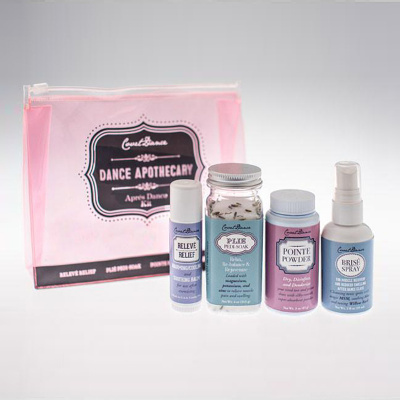 The Dance Apothecary Set from Covet brings the relief dancers need to revive the senses and ease muscle pain, bruising, and swelling. Inspired by vintage french apothecary design and classical ballet, the kit includes four artisan-made, natural products crafted to soothe, disinfect, and heal using naturally derived plant and mineral properties. Brisé Spray is a soothing and cooling treat for tired legs and feet specially formulated for muscle recovery and swelling after dance class. This invigorating tonic spray will cleanse your body, space and senses with one spritz. We combine the highest quality essential oils with the pain reliever and swelling reducer MSM, soothing Aloe, and toning Willow Bark. Brisé Spray will leave you smelling and feeling fresh with powerful, natural healing and antiseptic properties. Ingredients include soothing Organic Aloe, Peppermint and Spearmint Oils, magic MSM, Rosemary and Tea Tree Oils, and toning Willow Bark. Relevé Relief is the perfect remedy for sore muscles after a hard day at dance. This fair trade Certified Organic muscle rub has both warming and cooling properties. Ingredients include Fair Trade Certified Organic Cocoa Butter, Organic Beeswax, Organic Sunflower Oil, Essential Oil of Camphor, Organic Menthol Crystals, Olive Oil, Arnica and Vitamin E.
Plié Pedi-Soak - Relax, rebalance, and rejuvenate with the simple goodness of natural mineral salts and aromatic pure lavender oil. Magnesium, potassium, and zinc relieve muscle pain and swelling. Three therapeutic mineral salts provide maximum restorative benefits. Sea Salts stimulate circulation, ease muscle cramps, and help relieve overworked legs and feet. Luxurious 100% Lavender Essential Oil has natural calming and antiseptic properties to restore and clean tired feet and legs. The Covet Dancer Problems Kit measures approximately 5" tall and 5.5" wide.